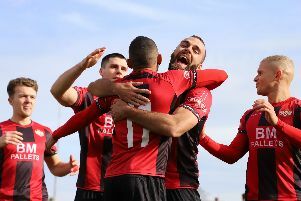 Marcus Law’s Kettering Town went eleven points clear of second-placed Stourbridge after a strong 2-0 win against St Neots Town. The Glassboys suffered a late 3-2 loss away to Royston Town, with former Kettering loanee Tom Knowles putting Stourbridge to the sword in the final few minutes, as he did for the Poppies in late January during Kettering’s 2-1 away success at the War Memorial Ground. 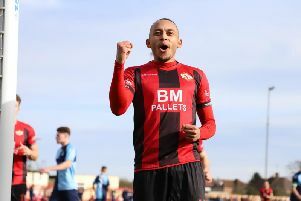 Kettering started brightly at Latimer Park, with Dion Kelly-Evans and Dan Holman forcing young Saints goalkeeper James Philip into good diving saves early on. The young goalkeeper, who impressed throughout the first half, parried wide a Declan Towers header from eight yards after a quarter of an hour before, two minutes later, former Kettering man Harry Beckley handled a deep, looping Holman cross in the penalty area after a nice passing move. Rhys Hoenes slotted the penalty into the bottom right hand corner for his 19th goal of the season in all competitions and he was in behind on 34 minutes, dummying Holman’s pass through Philip’s legs, but the ball was well cleared by St Neots captain Matt Miles before Hoenes could tap the ball in. Ben Milnes, whose passing was excellent all game, crossed in a dangerous, in-swinging ball from the resulting corner which was headed off the fist of Philip by his defender, allowing Declan Towers to head into the empty net. From kick off in the second half, Holman cut inside before unleashing a curling shot which crashed off the bar from the edge of the box, almost finding the top right hand corner. With five minutes to go, substitute Ben Toseland played a long ball to Hoenes whose backheel found Brett Solkhon who hit the bar from 12 yards, before Holman put the ball over after some good footwork inside the box one minute into injury time. Kettering were full value for the three points, dominating a young, hardworking and fit St Neots team in the first half and controlling possession in the second, seeing out a convincing result. St Neots did not play badly by any means and put in full effort for the 90 minutes, but the centre-back pairing of Towers and Craig Stanley effectively stifled any threat they posed, limiting the Saints to very few chances as Kettering’s experience and quality shone through. Kettering will now go into next week’s fixture away to Leiston hoping for revenge after suffering a late defeat to the Blues at Latimer Park early on in the season. Poppies: White; Kelly-Evans, Towers, Stanley, Kelly; Richens, Stohrer, Meikle (sub Toseland, 74 mins), Milnes (sub Solkhon 82 mins); Hoenes, Holman. Subs not used: Brighton, Bradshaw, Rowe-Turner. St Neots: Philip; Hood, Shaw, Dunnett, Norville-Williams; Beckley (sub Fulianty, 58 mins), Rhiney, Miles, Clarke; Sutton (sub Yeomans, 78 mins); Rider (sub Mutswunguma, 71 mins). Subs not used: Hudson, Abbott. Goals: Hoenes pen (17 mins, 1-0), Towers (35 mins, 2-0). Northants Telegraph man-of-the-match: Ben Milnes - the midfielder was reinstated into the Kettering starting line-up and he impressed. His performance against St Neots showed his quality as his crosses were perfect throughout and his passing orientated Kettering’s attacking play, particularly in the first half, while in the second half he was integral in keeping possession and seeing out his team’s victory.